In the World there are many social sites, which have their billion dollar value. 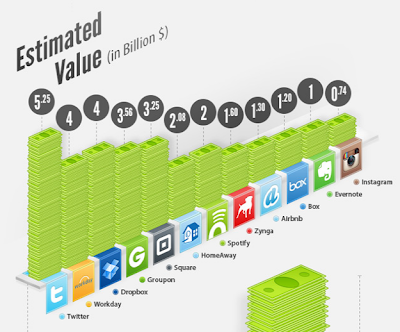 Staff.com presented infographic about the 12 multibillionior sites (since 2004) startup project like Instagram, Evernote, box, airbnb, zynga, spotify, homeaway, square, groupon , dopbox, workday, twitter and Facebook. In this infographic they shown there to estimate value of companies and how many employees work in their company. Instagram have only 13 employees and capital raised in 2 years 57 million dollars. Have a look this infographic.